The president of Syria, Bashar Assad may have been caught on aware with rumors as such while visiting Damascus the capital city, which is located on the SouthWestern region. The United States is well advance and prepare to face threats coming from the Middle East and thus will require minimum mitigation from our path base on the severity of these recent threats. More on this topic can be found on related links. 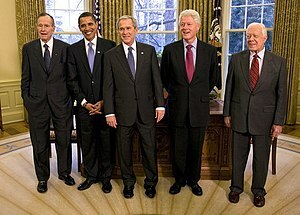 In January 2009, President of the United States of America, George W. Bush invited then President-Elect Barack Obama and former Presidents George H.W. Bush, Bill Clinton, and Jimmy Carter for a Meeting and Lunch at The White House. Photo taken in the Oval Office at The White House. This is an excellent debate topic to stimulate Geographical location, Current Event and Politics while sharing chocolates, drinks and pastries.